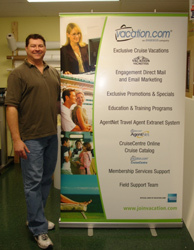 Roll Up Banner Stands are great for trade shows. Easy to transport and quick to set up, roll up banner stands deliver stunning results. Roll Up Banner Stands are also known as "Retractable Banner Stands," and "Pull Up Banner Stands." Call me (Mike), for help with your project. View additional Banner Stands at: www.GraphicProofs.com. I use this site when clients email servers or firewalls prevent them from accepting proofs. Shown to the right is a typical thirty three inch wide by seventy eight inch (33.5" x 78") roll up banner stand. "Life Time Warrantee on the Cartridge!" I have shipped these Roll Up Banner Stands across the nation. Customers from Miami, Dallas, Atlanta, San Diego, New York, Boston, and all keep coming back. These Banner Stand Graphics are printed using Professional Display media. For additional help designing your Banner Stand, see - "How to Make Good Banner Stand Graphics." Life Time Warranty on Cartridge! Quality Kodak Professional Film Substrate! Emergency Roll Up Banner Stands! Same Day Service if Possible! Don't forget your Tablecloth with Your Logo! Your tablecloth allows valuable advertising space and presents you as a professional! To see what others have done with their tablecloths, see Tablecloth Images!